Don't hold your breath waiting for Modern Warfare 2 to show up on the Wii: Infinity Ward says Nintendo's console just doesn't have the stones to deliver the gameplay experience it wants to create. The original Modern Warfare hit a lot of platforms: The 360, PS3, PC, the Mac and yes, even the Wii. Infinity Ward only developed the first three versions, however; Aspyr took care of the Mac port of the game while Infinity Ward's Call of Duty alter-egos at Treyarch are handling the Wii conversion. Nobody knows whether Activision will eventually have someone work up a Wii version of Modern Warfare 2 (the Wii edition of the original, Call of Duty: Modern Warfare: Reflex, doesn't come out until November 10) but one thing is certain: If it does happen, Infinity Ward won't have anything to do with it. 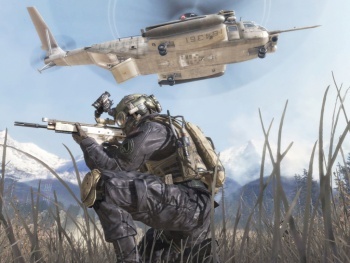 "If we felt like we could deliver the cinematic experience we were going for on other platforms, then we would gladly move to [the Wii]," Infinity Ward Community Manager Robert Bowling told Develop. "Right now, we don't think the Wii can deliver the exact experience that we're doing. We like to be very equal across all platforms, and if it's not equal then we won't do it." He also mentioned that no decision has been made about what the studio will do once Modern Warfare 2 is completed. "Once this is done, maybe we'll see about doing something new. If we do want to do something else, then we will do it," he continued. "We don't feel tied to making Call of Duty games. We still make Call of Duty games because we're having fun doing it. And when it stops being fun, we'll move onto something else."